Since the information technology (IT) boom in the 1990’s IT workers more than doubled between 1990 and 2000. 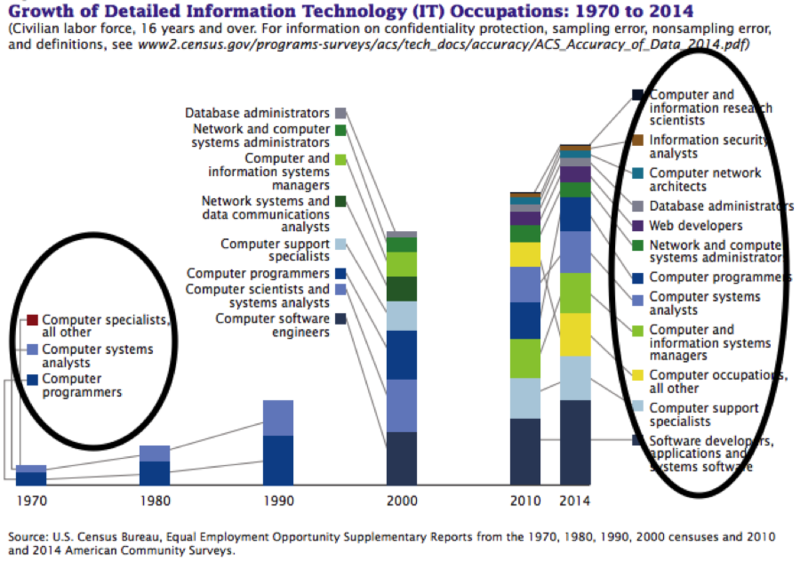 The chart below from the U.S. Census shows the growth since 1970 and the diversity of jobs that are available to IT professionals. From the chart above we can see that many different skill sets and job functions have been created from 1970 to 2014. The chart shows 3 categories in 1970 and 14 different categories in 2014. The industry has continued to grow and evolve from 2015 to 2018 and Big Data problems have given birth to a new set of job skills: Data Scientists, and Cloud Architects. Some of the key skills that Data Scientists possess include Python Programming, Statistical Analysis and Machine Learning. As the information technology industry continues to evolve into 2020, new skill sets will be required to meet the demands of this expansion. Information Technology continues to be one of the highest paying professions in the U.S. The information provided by the United State Department of Labor – Bureau of Labor Statistics shows the potential earnings for computer and information technology professionals by industry.